When I began to follow Jesus at the age of seventeen, I realized that I had never read all the way through the bible even though I grew up in a strong Christian home. I decided I would forgo all other elective reading until I had read through the word of God entirely. How else could I learn to discern what was right or wrong in other books that I might read? Since then my love for the scriptures has grown and my appetite for its daily sustenance has increased. About five years ago I was teaching a group of students at a Christian school and challenging them to consider how they spend their elective time. The average teen consumes 53 hours of media each week and I compared that to the time it would take the average reader to finish the entire bible. Are you ready for this? It takes about 75 hours. One of the students wrote to me and said they were going to put those statistics to practice and read the bible in 75 days by reading an hour a day. I was pleasantly surprised but it occurred to me that it was easy for me to spout off an impressive comparison but another thing altogether to apply it personally. I had never read the bible in 75 days. That gave me an idea, a personal challenge, and one for others as well. 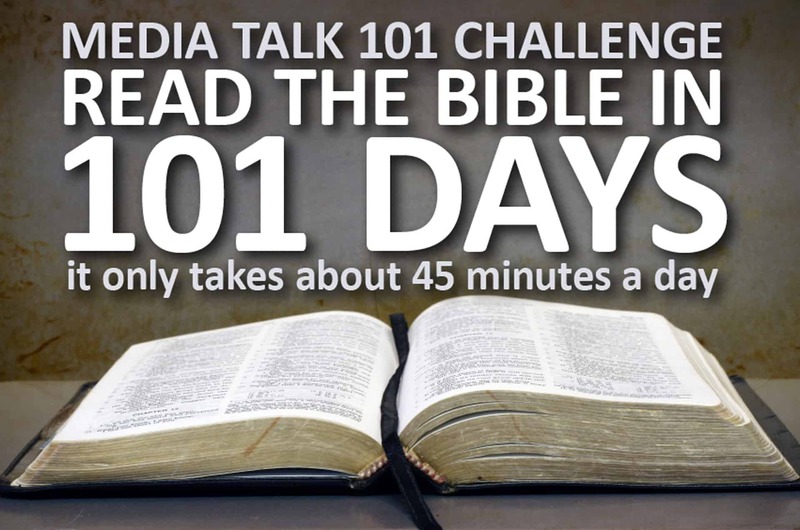 I decided to read through the bible in 101 days in conjunction with my ministry’s name, Media Talk 101. I set my course, kept a timer with my bible, and logged my progress. I timed myself every day (even when nodding off in some of the more tedious chapters) and the grand total after 101 days was 74 hours! That’s about 45 minutes a day on average, or about 3% of the day. I am now doing this for the fourth year in a row but it’s not just for the challenge anymore, it’s for the blessing I receive. As much as I love in-depth bible study and meditation on the word, I have found that reading the bible through in a short period of time gave me a wonderful panoramic view of God’s word. Many scriptures began coming together with this new perspective and my life was being spiritually impacted by this steady diet. 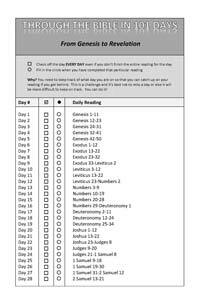 CLICK HERE to download the Genesis to Revelation in 101 days reading plan. 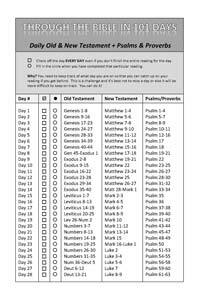 This has daily readings straight through the Bible from beginning to end. 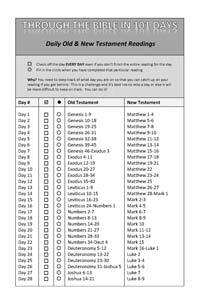 CLICK HERE to download daily readings from the Old Testament and New Testament through the Bible in 101 days. CLICK HERE to download daily readings from the Old Testament, New Testament, and Psalms or Proverbs through the Bible in 101 days. This is Phillip’s personal favorite!